"Elle" - Exploring the European Inland Waterways: Canal Lateral a la Loire: Ménétréol-sous-Sancerre – Léré – Beaulieu-sur-Loire – Châtillon-sur-Loire – Briare. The final days cruising. Just found your blog from an email exchange with Tom Sommers re: his new edition of the Belgium guide, and it turns out we're neighbors for the winter! We left Oldtimer mid-September on the quay just to the left as you come out of the last lock. We'll be returning mid-April probably. Maybe we can get together and swap lies...er, stories. I have been a lurker on your blog for quite some time! Yes, we saw Oldtimer moored up in Briare behind Doris Pickle and with Joli Roger alongside. We arrived back in SA on Tuesday evening and are planning to be back in Briare sometime in the last week in April 2019 so unfortunately will probably miss you. We will be heading north for the Somme and then east to somewhere - not sure at this stage where we will overwinter in 2019. I have seen your barge before and I might even have a photo of it somewhere - will let you know if I find it. Thanks for making contact and as you say, maybe we will meet over a bevvy somewhere. Btw, I've updated the pics on the last post and you might recognise one or two boats in it. Ahhhh there she is all snug and well protected by lots of other steel. Luckily we put out the heavy duty winter mooring lines. Thanks! ps Our direct email is in our profile on our blog page. A great last issue Shaun. Sailing a bit close to the wind by suggesting that Lynn on the bow was helping your draft. Thanks (not) for adding to our concerns about travelling that route with our 1.2 m draft. But I will keep in mind the idea of sending Lisette to the bow. Back in OZ and only partially retired it turns out, which has delayed gettin our blog restarted. Will happen though. Hope to catch you next year. Yes, I wondered if I would get away with the figurehead comment but am still alive. 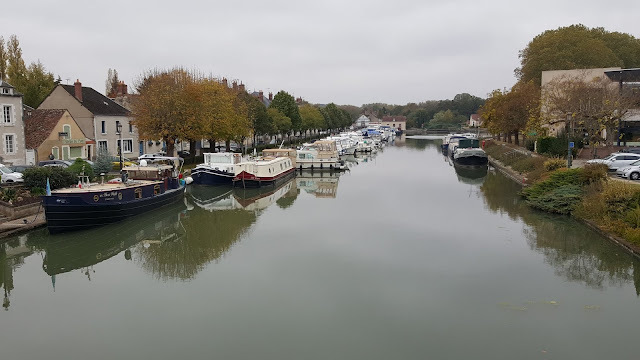 If you want to visit Briare then use the Canalous/commercial port before the first lock - look at it on Google Earth; the embranchment to the PdP and the Locaboat base basically doubles back on the main canal. Best wishes to you both and hopefully we will meet somewhere next year.